Chloé presents an exclusive new style inspired by the freedom of the African desert and the spirit of adventure. 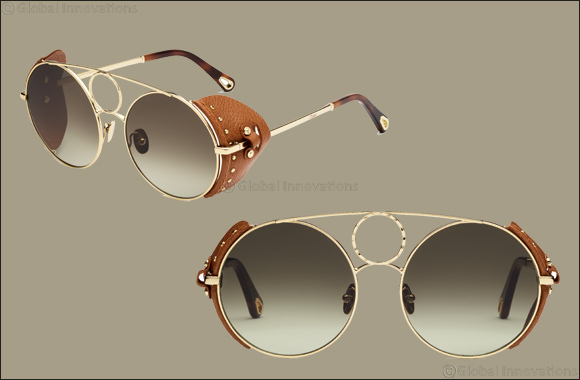 June 4, 2018: Specially designed to complement the launch of the new Chloé Nomade fragrance, this new silhouette evokes a vintage attitude and features a full-metal structure embellished with soft leather blinkers, which are removable and pierced with luminous studs and two sunburst-shaped rivets placed on the sides. The lightweight profiles are further enhanced by a precious metallic circle placed between the double bridge detail, crafted with a traditional jewelry technique which creates a smooth, hammered finish. The subtle effect of the gradient khaki lenses recalls the color of the leather, highlighting the vintage feel of the bold and free-spirited design. The light temples are fitted with invisible hinges and completed with acetate end tips with the signature teardrop cut-out, which serves as an aesthetic and functional element for attaching the optional chain accessory. The frame is equipped with tone on tone metal nose pads.